West Side Campaign Against Hunger is a one-stop gateway to hundreds of social service programs. The first step a new customer takes is to meet a social service counselor. At that meeting, the counselor will determine the customer’s family size so that he or she can get a food card and start shopping. But food isn’t enough to help people improve their lives. Many customers have other needs, and West Side Campaign Against Hunger can connect them to a world of supportive services, whether its information and referral, or more intensive case management. If you are not insured, we can help you enroll in a health plan, find a doctor, and obtain prescription drugs. We can also help you find an affordable clinic to receive medical services you may need. From February through April, we host a free tax return service. If you work, you can apply for the Earned Income Tax Credit. We can help you with Public Assistance, HASA, Social Security benefits, rent increase and exemption programs. You may be eligible for SNAP (Food Stamps), Women Infants and Children (WIC), Free or Reduced School Meals. West Side Campaign Against Hunger offers SNAP enrollment on site every week on Mondays from 7:30 am – 2:00 pm or 10:30 am – 4:00 pm, Wednesdays from 7:30 am – 2:00 pm, Thursdays from 7:30 am – 2:00 pm, and Fridays from 7:30 am – 2:00 pm. We can also help you find senior meals, food pantries and soup kitchens in your community. West Side Campaign Against Hunger can refer you to many programs: our own Customer Chef Training Class or GED, English as a Second Language Class, child care, resources for special needs, job training and resume assistance. West Side Campaign Against Hunger can refer you to housing services, and provide information on supportive housing, legal advocacy and other options. Since 2006, Sophia (not her real name) has been coming to West Side Campaign Against Hunger for food and other services. Sophia is an undocumented immigrant, married with two small children and she is now pregnant again. Her husband is the sole supporter of the household. The family has to rent out a room in their apartment just to manage the monthly rent. When West Side Campaign Against Hunger began to offer SNAP (food stamp) enrollment on-site, Sophia applied through us for the benefit for her children (who are eligible despite her undocumented status). Her children were granted $182 in SNAP benefits. After that, Sophia continued to seek help with us at every opportunity. Within the last year counselors have helped her re-certify for her SNAP benefits. We also assisted her with applying on-site for Medicaid for pregnant undocumented individuals through our partner agency Children’s Aid Society. We sent Sophia for WIC benefits for pregnant women and young mothers, which she successfully obtained. 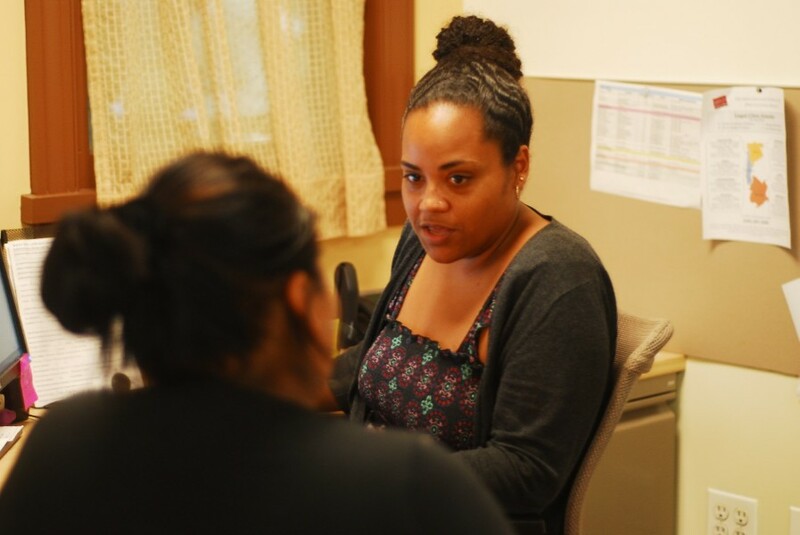 Our counseling staff also helped Sophia retrieve a lost birth certificate for her daughter and is currently assisting with Medicaid renewal for her daughter. We’re proud to be able to offer such a range of services to a struggling family. To better serve our customers, we offer workshops and services on-site that are made possible through key partnerships with not-for-profit organizations and government agencies. Read more about our other partnerships with like-minded organizations. Receive free tax preparation from February to April for seniors, working, disabled, and immigrants. GMHC offers free HIV testing at West Side Campaign Against Hunger. An onsite counselor offers free financial counseling and help with opening a bank account, budgeting, identity theft, credit reports, and home ownership. Through the Homelessness Outreach and Prevention Project (HOPP), meet with a legal representative for problems with Public Assistance, Food Stamps and Eviction Prevention. Connect with Visiting Nurse Services of New York at West Side Campaign Against Hunger and learn about home care services, private care services, hospice and palliative care, and VNSNY community programs.